Previously I had only eaten at Café Rouge in the evening but I really did enjoy what they had to offer for breakfast. My family and I headed along with a 2 for 1 voucher in hand and had what I think was our first official family brunch. I decided to try out the eggs benedict as since trying the well-known dish at the airport before Malta, I am addicted and determined to find the very best eggs benedict Edinburgh has to offer! Might start a short blog series on that so hit me up with your local eggs benedict suggestions. FYI, the duck eggs benedict (how many times can I say that in one blog post? The count is on.) was delicious! I am very excited to try this combination again! Of course, the menu does have the usual English breakfast which was included in our voucher and my dad said it was "nice" which means roughly 8/10 from him. If you are a vegetarian - fear not, for Café Rouge also have a vegetarian English breakfast which I tried on my second brunch here. The dish is meant to come with avocado (yaaas) and spinach, but unfortunately both times I have visited they have been out of spinach. The mushrooms however are simply delicious and the beans are unexpectedly tomato-y which was a pleasant surprise as I tend to not get on with baked beans. 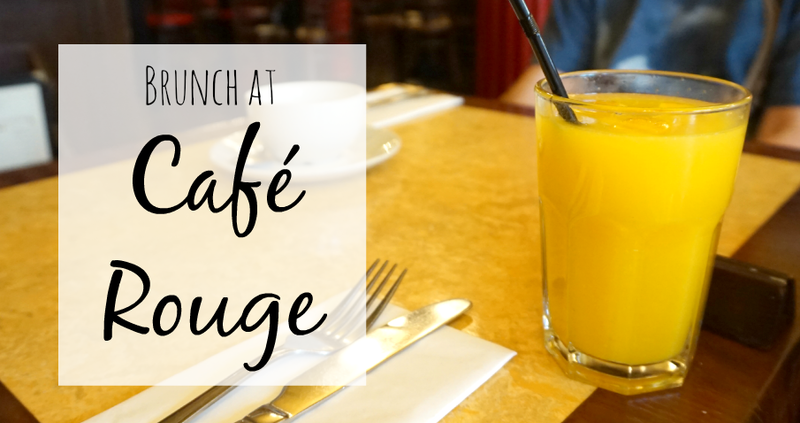 If you are looking for something a little more French for your breakfast at Café Rouge, as it is definitely a French restaurant, there are a few other options which sound amazing. I will definitely be returning to try the Chouquettes which are "baked in-house choux balls, coated with sugar, served with crème fraîche or hot chocolate dipping sauce." As you can see, my sister and I were two very satisfied customers. For two people, you can easily get a breakfast with drinks for £20 or under which is pretty good I'd say. And really, you're paying for breakfast and lunch (brunch) because it's a filling meal which means it's even better value! Now you have no excuse not to try Café Rouge. Ha! Where is your favourite place to brunch? And where can I find the best eggs benedict guys c'mon help me out!